This article will describe the benefits of sleeping on the floor to reduce back and neck pain, along with the all-night tossing to and fro we’ve all experienced over years of sleeping on a fluffy mattress. Sleeping on the floor will indeed make you wake up feeling more refreshed. The information laid out on this page is based on my own experience and not copied from any other source. I ditched my traditional mattress seven months ago (as of this writing), attracted by the many benefits of sleeping on the floor I’d learned through extensive research. Like many of you reading this right now, I was sick of tossing and turning on a mattress every night, only to wake up with a kink in my neck and terrible posture and lower back pain. It’s really hard to hold your head up when your entire spine is messed up from sleeping on an unnatural surface. Fact is, we don’t need help keeping our back in line. Lifestyle choices such as doing a job that requires repetitive actions that wreck our neck, back, and shoulders. Work, sports, lack of stretching, and LAZINESS can all screw up your back. A ‘comfy’ mattress is the root of back and neck pain. I truly don’t believe that the things we do while waking are entirely the sole aggravating factor when it comes to spinal alignment issues and poor posture. After I began sleeping on the floor and learned how to do it properly (I’ll get into this in a minute) I realized that sleeping on mattresses had been messing with my back for my entire life. A mattress makes you sink down into it, regardless of your preferred position. Our torso and upper leg area are the heaviest parts of the body, driving these parts deeper into the mattress than our upper body and head. This one problem leads to persistent disk misalignment and causes nerves throughout the upper body to get pinched. Sleeping on the floor doesn’t allow for this kind of misalignment after you train your body to do it right. This is where the benefits of sleeping on the floor truly shine. You might feel a bit tight and need to stretch a bit after a night sleeping on the floor, but over time you’ll find you wake up more refreshed. That persistent pain in your back and neck due to misalignment will eventually go away. However, there is a learning curve when you’ve spent your entire life sleeping on the floor. The following benefits are those I’ve realized based on my own experiences. FITE4 isn’t one of those generic mattress websites that try to sell you expensive floor mattresses and other gear. By the way, such products are nothing more than over-priced yoga mats and futons — don’t waste your money. Make the shift to sleeping on the floor instead of a traditional bed, and you’ll figure out what type and level of padding you need. 1. Significantly reduced back and neck pain. I also noticed a reduction in shoulder pain and headaches that would pop out of nowhere. ‘Zero’ pain isn’t a guarantee I can make. I don’t know what you do for a living, how old you are, or what kind of injuries you might have. If you sleep on the floor using the tips provided further down, I can guarantee you’ll notice a remarkable difference after a couple of months of dedicated practice. 2. You’ll get up faster. Listen, if you’re one of those people who drives everyone around you crazy with a loud alarm every morning, sleeping on the floor will set you free. Forget about multiple rounds with the snooze button. The floor doesn’t make you feel like you’re sleeping on a cloud. You’ll actually want to get up. In the morning you can just fold up your floor mattress and toss it in the closet. Then use that extra space to do some calisthenics before starting on the rest of your day. Not to mention, no more stubbing your foot on the legs of the bed! There’s also a good argument that the threat of bed bugs also goes down. A proper floor mattress won’t offer the habitat they live and thrive in. I’m not going to lie to you. Your life will get better after sleeping on the floor after a short transition period. However, expect some groggy mornings and increased tossing and turning for a bit if you’re a side-sleeper like me. I can only imagine back sleepers have a much easier transition, but I have no experience in this area. Most of what I’ve read backs that guess up though. As far as sleeping on your stomach, I’m not sure how anyone could get a comfortable sleep doing so on any surface. Don’t sleep directly on the floor. Even a carpet won’t afford much comfort over the long haul. Sleeping on a rock hard floor will lead to pressure points being compressed. This can lead to arm and/or back numbness depending on your preferred sleeping position. Some people find a yoga mat to be enough cushion. I’ve settled on a 1/2″ thick roll out exercise mat, topped with a 2″ thick fold out exercise mat. There’s no need to be brand specific, but after months of sleeping, I find this combo to be perfect. Puffy pillows won’t cut it. I’ve read that back sleepers benefit from no pillow at all, but you’ll want to experiment. If you’re a side sleeper like me, you’ll need to change your ways to be a successful floor sleeper. Those firm, puffy pillows designed for side sleeping will lead to nothing but problems sleeping on the floor. While my back pain disappeared at first, I still had a stiff neck every morning because I was using a pillow that elevated my head too much. Instead, cradle your head using your arm and cushion between with a thin pillow. Keep the area you sleep clean. Dust and dirt are easy to ignore when you have a bed elevated way off the floor. 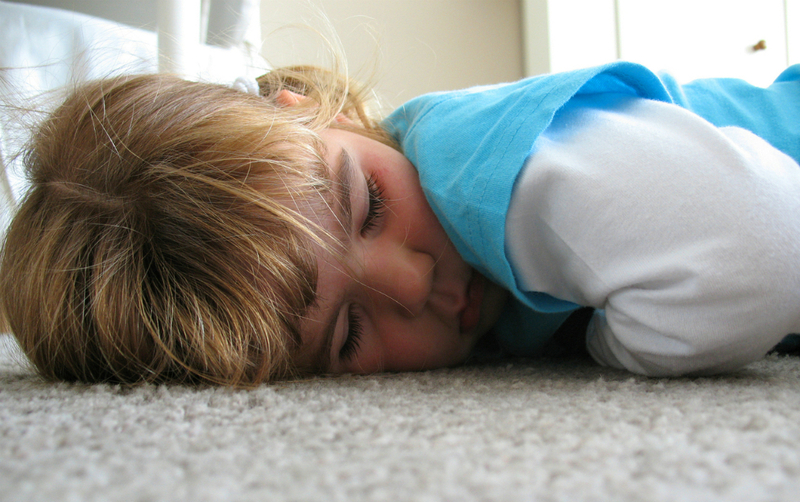 Dust-bunnies and allergens will be inhaled much easier when you’re lying at floor level. Vacuum often and your nose and lungs will thank you for it. I always have a whisper-quiet air purifier running too, with a clean filter installed and the ionizer (if equipped) turned off. I’d like to restate that you really shouldn’t run out and buy anything that touts to be the “most comfortable floor mattress.” The majority of the products out there have way too much padding, meaning you’ll have the same alignment issues you started with. Plus, the thicker and plusher the mattress material, the more stuffy heat it will retain. Same goes for anything claiming to hail from Japan, where most people sleep on the floor on a small mat or futon. These products will work just fine but will cost more than the generic suggestions I’ve offered. Minimalist is best — you want to keep things simple. Dense material is preferable long-term over more plush options. Start out with a simple and cheap yoga or exercise mat and build from there. You may end up with a couple of different materials, as I have. You might also find that a thin mat gives you the most comfort and pain relief. I recently did an interview on this subject with Karina over at The Art of Sleeping on the Floor. You should check out her site, as it goes into far more detail on this topic. Let me know when new content is posted.